Peugeot recorded the strongest performance in the Irish new car market this January, as demand for the Peugeot range continues to soar; the lion brand saw a huge 71% increase in passenger car registrations for the first month of 2018. The success comes on the back of demand for the Peugeot 2008 SUV, the Peugeot 3008 SUV, crowned Irish Car of the Year 2018 and the newly launched 5008 7-seat SUV. The strong growth assured the Peugeot marque of a top ten place in the sales league and a 4.3% overall market share, cars and vans combined. The growth has solidified Peugeot’s position as a top ten best-seller in the country, as the brand now looks forward to a number of further new product launches and Dealer appointments in 2018. 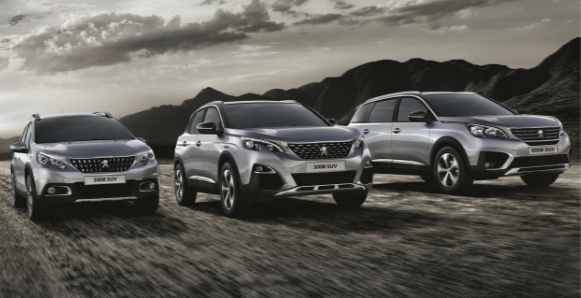 Pictured from left to right are: the Peugeot 2008 SUV, voted Irish Compact SUV of the Year 2017; the Peugeot 3008 SUV, crowned Irish Car of the Year 2018, in association with Continental; the newly launched Peugeot 5008 SUV, number one in the Irish Times Top 100 New Cars 2018 league.